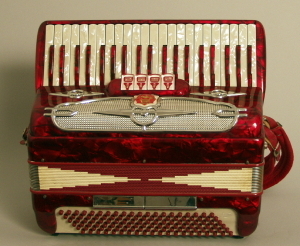 Castiglione Red/3445 Model Keyboard Accordion, c. 1960's, made in Italy, red pearloid finish, original hard shell case. A sweet 120 bass 3/4 size piano accordion by Castiglione, a leading manufacturer/distributor of quality free-reed instruments, established in Detroit in 1933 by Italian immigrant Vincent Castiglione (the company is now run by his son John). Weighing in at 16 pounds, this little beauty plays and sounds as good as it looks. Perfect for players with smaller hands or those looking for a compact "travel" accordion with a full range. 41 treble keys. 4 treble registers (Master, Violin, Bassa, Master), 2 bass switches. 3/4 reeds. 15 3/4" treble keyboard. Original red leather/velvet padded straps and hard shell case. Height is 8 in. (20.3 cm. ), 16 in. (40.6 cm.) width, and 14 1/2 in. (36.8 cm.) . Excellent Condition.